Whenever electrons move, current is created. In fact, current measures that movement; specifically, it is the charge that moves divided by the time it takes to move (or, if you've taken calculus, it's the derivative of charge with respect to time). Sometimes, current is steady, like in a simple circuit. Other times, the current changes as time goes by, like in an RLC circuit (a circuit with resistor, inductor and capacitor). Whatever your circuit, you can calculate the amplitude of the current either from an equation or from directly measuring properties of the circuit. The equation of current in a circuit with a capacitor or an inductor is I=Asin(Bt + C) or I=Acos(Bt + C), where A, B and C are constants. The equation for current of a simple circuit is Ohm's law, I=V÷R, where I is current, V is voltage and R is resistance. In this case, the amplitude of the current remains the same and is simply V÷R. The equation of current in a circuit with a capacitor or an inductor should be in the form I=Asin(Bt + C) or I=Acos(Bt + C), where A, B and C are constants. 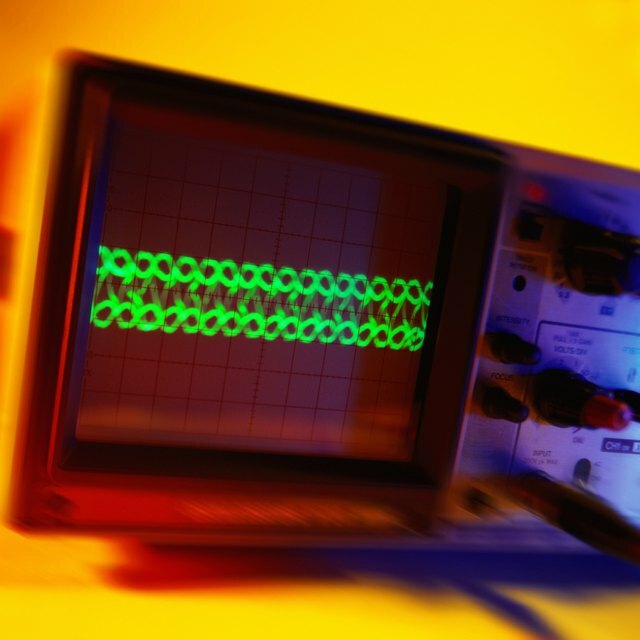 Set up your circuit as desired and connect it, in parallel, to an oscilloscope. You should see a sinusoidal curve on the oscilloscope; the signal represents the voltage through the circuit. Count the number of vertical grid lines, called divisions, on the oscilloscope from the center of the wave to its peak. Now check your "volts per division" setting on the oscilloscope. Multiply that setting by the number of divisions to determine the voltage at the peak. For example, if your peak is 4 divisions above the center of the graph, and the oscilloscope is set to 5 V per division, then your peak voltage is 20 volts. This peak voltage is the voltage amplitude. Find the angular frequency of the wave. First count the number of horizontal grid lines/ divisions that the wave takes to complete one period. Check your "seconds per division" setting on the oscilloscope and multiply that by the number of divisions to determine the time period of the wave. For example, if a period is 5 divisions, and the oscilloscope is set to 1 ms per division, then your period is 5ms, or 0.005s. Take the reciprocal of the period, and multiply that answer by 2π (π≈3.1416). That’s your angular frequency. Convert voltage amplitude to current amplitude. The equation you use for the conversion will depend on what components you have in your circuit. If you have only a generator and a capacitor, multiply the voltage by the angular frequency and by capacitance. If you have only a generator and an inductor, divide the voltage by the angular frequency and by inductance. More complicated circuits require more complicated equations. Boley, Allison. "How to Calculate Current Amplitude." Sciencing, https://sciencing.com/calculate-current-amplitude-2687.html. 14 May 2018.